Clare has lived and worked in Wythenshawe most of her life. She attended St Aidan’s Primary School, The Hollies Convent and has a degree in Mathematics. Since leaving school, Clare has worked for the Department for Work and Pensions in a variety of roles. 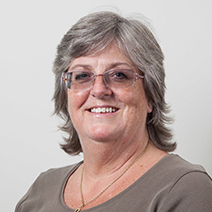 Since 1997, she has specialised in Finance, supporting the Director of NW Jobcentres. She has a particular interest in services for the elderly and disabled and was on the Tenant Committee of PG before joining the WCHG board. Clare is also the Safeguarding champion for the Board.